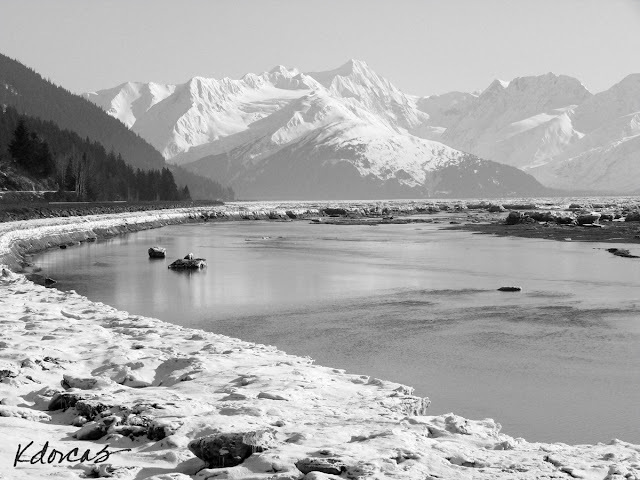 Never tire of the drive to/from the "Kenai" to Anchorage. How truly blessed we are. Wonderful airy image. I wish I could get tones like these. Black and white is so difficult on screen compared with negative to paper. And what a view! What amazing scenery you have during your drive. Great shot! Exquisite! Like a landscape drama of shape and tones! Wow, fabulous scenery Karen! Just lovely. Amazing scenery. Gorgeous in black and white. Beautiful photo! It feels crisp. This is stunning Karen. This image belongs on a wall in a place of honor!!! I was stationed at King Salmon AFS in 1963-1964. What I saw of Alaska was from the air. Stunning photo! I love the delicacy of those mountains. Love the excellent contrast and sharpness. Amazing, and I can see why you would never tire of this view. Oh to be able to visit you.